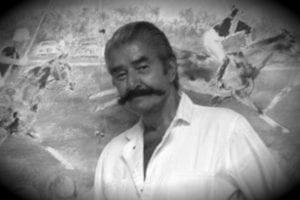 Leroy Neiman was one of the foremost American artists of the 20th century. Born in St Paul in 1921, the artist had a long and highly prolific career, ending with his death in NYC in 2012 at the age of 91. His focus on leisure activities and athletes in his paintings led to him being characterized as an American Impressionist. Yet the bold, bright colors in his works align him more with the Abstract Expressionists and other Modernists. 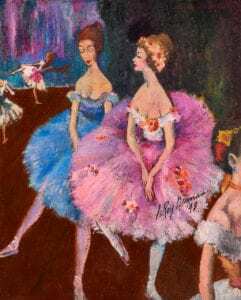 In this rare painting from very early in his career, Neiman is making obvious reference to Degas with his depiction of ballerinas rehearsing. However, he abandoned the older artist’s pastel palette in favor of the bold colors that he would become so well-known for. This may in fact be the oldest signed painting by Leroy Neiman on the market today. The painting still resides in its original frame, and is painted by the artist with flecks of colors that complement the main scene. Careful rendering of the ballerinas and their costumes are typical of his very early work, as his later subjects would be captured in very quick, almost frenzied brushstrokes. Yet the bright colors, aimed at inciting an emotional response in the viewer, would always remain a constant throughout his career. Leroy Neiman was born and raised in St Paul, Minnesota. Despite a difficult and unstable family life, his artistic talent was recognized at an early age. After serving in the army, Neiman returned to St Paul and studied briefly at the St Paul School of Art. This painting is dated 1948, at which point Neiman was studying at the prestigious Art Institute of Chicago. After 4 years of study there, he stayed on to teach at the Art Institute for another 10 years. While teaching, he also pursued his independent career and quickly became very successful. In 1953, one of his paintings was purchased by the Minneapolis Institute of Art, and he had his first solo show at a gallery in Chicago. A few years later, in 1957, one of his paintings was included in the American 25th Biennial Exhibition in Washington D.C., solidifying his national reputation. In 1962 Neiman settled in New York City, where he lived for the rest of his life. Throughout his career, Neiman’s art was shown in over 50 solo exhibitions around the world, along with many group exhibitions, including one with Andy Warhol in 1981. Later in his career he became a successful printmaker as well, earning millions annually from the sale of his prints alone. Neiman was fascinated with public events, and the way people presented themselves to the world—a quality that is notable even in this early painting of ballerinas. He was a well-known figure at many important public events of the late 20th century, including the Olympics and Super Bowl, where he created sketches from life to capture the moment. Countless magazines and books have published the work of this great American master. An archive of his work is kept in the Smithsonian Institution, revealing his seminal importance to American art and culture. If you have one you would like to have a appraised or sell please get in touch.